When it comes to family fun in Astoria, NY, Bounce N’ Play has you covered. Our larger than life inflatables, gym, and other play areas offer a unique and exciting destination for you and your kids to have a clean and safe time! With such a unique facility, we have many regulars and repeat customers walking through our doors. Many repeat visits can start to add up in your bank account over time, so we’re here to help. What can you expect to find in our online store? Find out! Session Bundles – Want to give our facility a trial run over a few sessions? Check out our session bundles and let the fun begin! Monthly Memberships – Are you regulars to Bounce N’ Play? If you and your kids find it difficult to stay away from the fun, our monthly memberships offer a great way to save money! Mercury Gift Card – What better gift to give than the gift of a great experience! Whether its a birthday, holiday or special occasion give the gift of Bounce N’ Play fun. 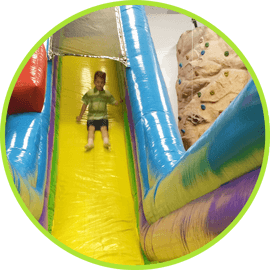 Seasonal Parties – From Halloween to the Holiday season, host a seasonal party at Bounce N’ Play. All of our parties are 100% private, and you can expect a hassle-free atmosphere with no shortage of smiles.